This is definitely the warmest summer ever! Since the start of March, I have been looking out for cool drinks and desserts to bring the temperature down. Of course, there is my long running love for Serenitea's Hokkaido Milk Tea. While shopping at SM Megamall today, I got myself a large cup of my favorite cool drink since I was in college. To be honest, I wasn't sure really was goes into this yummy drink until lately when I bravely asked the server what this drink consists of. He then told me that it has a mix of sago and nata de coco + a layer of three different puddings + ice crushed taro mix. Yum! 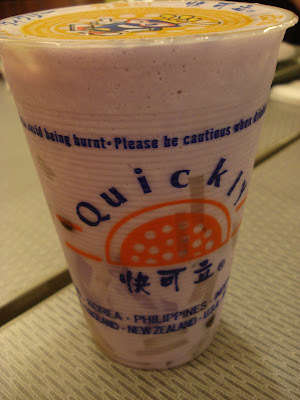 I am a fan of anything with nata and taro. This is the best thirst-quenching drink while strolling around the mall.